Prototype: French construction train painted and lettered for Colas Rail, used on the SNCF. 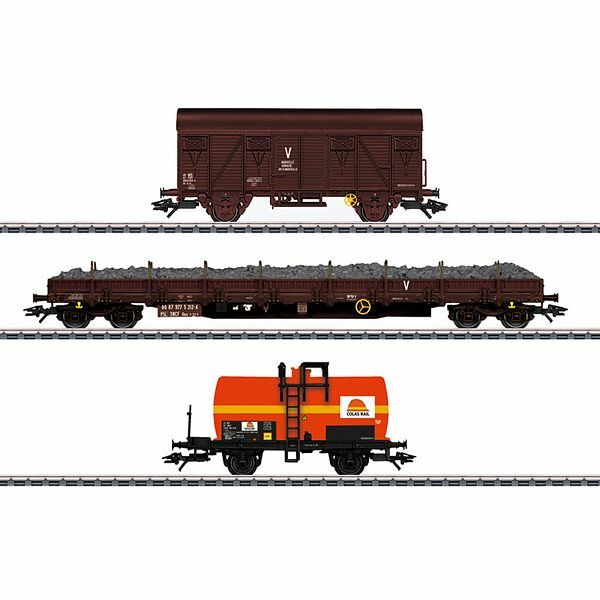 3 different design freight cars. 1 boxcar, 1 French type Uas special car (derived from a type Res), and 1 tank car. Model: The 2-axle boxcar is in dark brown with yellow hand wheels. The 4-axle low side car as a French special car is also in dark brown with yellow hand wheels and a load of ballast. The tank car is in orange/yellow. It is a 2-axle car in a very striking paint scheme. Total length over the buffers approximately 44.5 cm / 17-1/2". DC wheelset E700580. Low side car includes a load of ballast. Tank car includes a very striking paint scheme. The locomotive to go with this car set can be found in the Märklin H0 program under item number 39214.